This is the original machine that so many tried to copy and totally failed. sical fitness and rehabilitation system on the market. After years of research and development by the Coto Research Center of Coto de Caza, Calif., a leading independent laboratory in the fields of biomechanics and sports medicine, the ARIEL strides past the standard method of exercising and propels fitness training into a new dimension. Computer Biomechanical Analysis, Inc. integrates the world of computers to incredibly efficient exercise stations to guarantee the individual the most effective and exciting method of exercising the 20th century has to offer. resistor packages instead of weights, springs or manually-adjusted hydraulic or pneumatics resistance to insure safety, quietness and efficiency. By using color graphics monitors to illustrate the individual's exercise performance, persons can follow a predetermined exercise program or create a physical profile relating to each individual's strengths, weaknesses, speed and endurance. ï¿½ PERSONAL TRAINING AND REHABILITATION PROGRAMS-Each individual can develop a personal flexible exercise program with professional guidance. ï¿½	STORAGE OF PERFORMANCE-Data storage can chart and save each individual's workout and diagnostic history. ï¿½	COMPARISON DATA-Through the use of graphs, the Individual can compare strength, speed and endurance against previous performances or the top athletes of the world. ï¿½ EASY TO OPERATE-Comes with simple instructions and can be set up to proceed automatically to each exercise, eliminating manual adjustments and direct supervision. ï¿½	PERSONAL AND OFFICE COMPUTER-Uses stateof-the-art computer to store accounting data and other personal and office work. ï¿½	SEVERAL MODES OF TRAINING-Uses isokinetic, isotonic and isometric routines, used separately or in combination, for programming. ï¿½	SAFE-Bar remains where individual leaves it, no matter what position. ï¿½	RESISTANCE OR SPEED AT ANY POSITION-Programs can preset each exercise to a given level of resistance or speed to any angle desired on both the upstroke and downstroke, each computed individually. OUIET OPERATION-No weights or weight stacks to create unnecessary noise. ï¿½	FORCE CURVE-Illustrates the force lifted in relation to time. the position of the bar and the pace of lifting. ï¿½	DIAGNOSTIC TESTING-Evaluates strength, speed and range of motion, and compares different training periods. EXERCISE MODE-Gives seven options for different varieties of exercises. ï¿½ REHABILITATION DATA-Lists instantaneous data on pertinent information, including peak force, peak hold, delay time and fatigue index. ï¿½	TAILOR EXERCISE PROGRAM-Terminal allows individual to program personal exercise program for each session. The program will be followed automatically until changed. ï¿½	COMPARES PERFORMANCES-Saves and recalls previous exercises and compares them with current performances and/or optimal performances and training goals set earlier. ï¿½	PRINTOUT DATA-Easy-to-read printout sheet gives instantaneous data on weight, angles, force, speed. etc., on exercise performed. The relationship between resistance exercises and muscle strength has been known for centuries. In ancient Greece, Milo, the wrestler, used progressive resistance exercises to improve his strength. His original method consisted of lifting a calf each day until it reached its full growth, and this technique provides probably the first example of progressive resistance exercises. Today, it is well documented in the literature that the size of skeletal muscle is effected by the amount of muscular activity performed. Increased work by a muscle can cause that muscle to undergo compensatory growth (hypertrophy) while disuse leads to wasting of the muscle (atrophy). This information has stimulated the medical and sports professions, especially coaches and athletes, to try many combinations and techniques of muscle overload. These attempts to produce a better means of rehabilitation or a physiological edge in sporting activities have only scratched the surface of the cellular mechanisms and physiological consequences of muscular overload. The 434 voluntary muscles in man constitute 40 to 60 percent of his total body weight. These muscles are responsible for human motion, which is the most fundamental function of the musculoskeletal system. Muscular strength may be defined as the force a muscle group can exert against a resistance it a maximal effort. In 1948, Delorme (35) adopted the name "progressive resistance exercise" for his method of developing muscular strength through the utilization of counter balances and weight of the extremity with a cable and pulley arrangement and, thus, gave load-assisting exercises to muscle groups which did not perform antigravity motions. McQueen (6) distinguished between exercise regimens for producing muscle hypertrophy and those for producing muscle power. He concluded that the number of repetitions for each set of exercise determines the different characteristics of the various training procedures. Based on evidence presented in these early studies, hundreds of investigations have been published relative to techniques for muscular development including isotonic exercises, isometric exercises, eccentric contractions, the Oxford technique, the double and triple progressive super set system, and many others. Each system's effectiveness has been supported and refuted by numerous investigations. Berger (13) concluded that 6-7 repetitions three times a week was best for developing dynamic strength. Research conducted by Steinhause (86) emphasized the need to increase the intensity-not the amount of work-in order to develop maximum strength. In more recent studies pertaining to exercise, Pipes and Wilmore (75) compared isokinetic training to isotonic strength training in adult men. According to their findings with isokinetic contractions at both low and high speeds, the isokinetic training procedure demonstrated marked superiority over the isotonic methods. 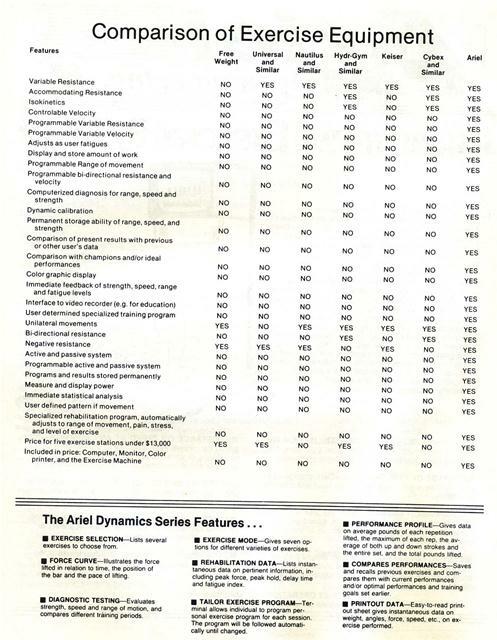 In 1972, Ariel (3, 4, 5, 6, 7) introduced the Dynamic Variable Resistance exercise principles which resulted inthe variable resistance exercise equipment (Universal Gym Equipment's DVR Model). 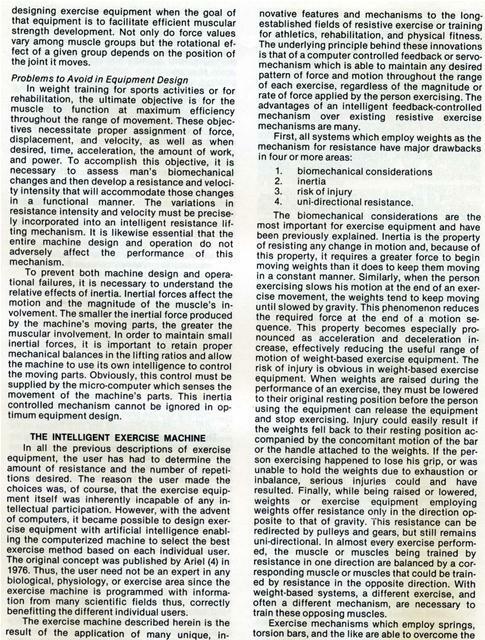 For the first time biomechanical principles were employed in the design of exercise equipment. 1. Muscular Strength. The contracile power of muscles as a result of a single maximum effort. 2. Muscular Endurance. Ability of the muscles to perform work by holding a maximum contraction for a given length of time or by continuing to move a submaximal load. 3. Isometric Training. A muscular contraction of total effort but with no visible limb movement (sometimes called static training). 4. Isotonic Training. Raising and lowering a submaximal load, such as a weight, a given number of times (sometimes called dynamic training). 5. Isokinetic Training (Accommodating Resistance). Muscular contraction at a constant velocity. As the muscle length changes, the resistance alters in a manner which is directly proportional to the force exerted by the muscle. 6. Concentric Contraction. An isotonic contraction in which the muscle length decreases (i.e., the muscle primarily responsible for movement becomes shorter). 7. Eccentric Contraction. An isotonic contraction in which the muscle length increases (i.e., the muscle primarily responsible for movement becomes longer). 8. Muscle Overload. The workload for a muscle or muscle group which is greater than that to which the muscle is accustomed. 9. Repetitions. The number of consecutive times a particular movement or exercise is performed. 10. Repetition Maximum (IRM). The maximum resistance a muscle or muscle group can overcome in a maximal effort. 11. Sets. The number of groups of repetitions of a particular movement or exercise. contracts, the resistance changes in a predetermined manner (linear, exponentially, or in a user defined manner). 13. Variable Velocity Exercise. As the muscle contracts with maximal or submaximal tension, the speed of movement changes in a predetermined manner (linear, or exponentially, etc.). 14. Vertical Jump. A jump executed in the vertical plane performed from a standing position on a force plate. which the arms are fully extended. The previously cited research and equipment were performed with "tools" which lack intelligence. That means the equipment was "unaware" that a subject was performing an exercise on it. For example, the equipment employed in the study conducted by Pipes and Wilmore assumed certain velocities on the isokinetic modality used. However, verification of the speed was impossible since a closed loop feedback and sensors were not used as they do not exist on the equipment employed. However, with the advent of miniaturized electronics in computers, it is possible today to join exercise equipment with the computer's artificial intelligence. Another important consideration in both the design of equipment and the performance of an athlete or a busy executive is that the human body relies on preprogrammed activity by the central nervous system. This control necessitates exact precision in the timing and coordination of both the system of muscle contraction and the segmental sequence of muscular activity. Research has shown that a characteristic pattern of motion is present during any intentional movement of body segments against resistance. This pattern consists of reciprocally organized activity between the agonist and antagonist. These reciprocal activities occur in consistent temporal relationships with the motion parameters, such as velocity, acceleration, and forces. Hellebrandt and Houtz (48B) shed some light on the mechanism of muscle training in an experimental demonstration of the overload principle. They found that repetition of contractions which place little stress on the neuromuscular system had little effect on the functional capacity of the skeletal muscles; however, they found that the amount of work done per unit of time is the critical variable upon which extension of the limits of performance depends. The speed with which functional capacity increases suggests that the central nervous system, as well as the contractile tissue, is an important contributing component of training. muscle and gravitational forces are important in producing these turning effects which are fundamental in body movements in all sports and daily living. Pushing, pulling, lifting, kicking, running, walking, and all human activities are results of rotational motion of the links which are made of bones. Since force has been considered the most important component of athletic performance, many exercise equipment manufacturers have developed various types of devices employing isometrics and isokinetics. When considered as a separate entity, force is only one factor influencing successful athletic performance. Unfortunately, these isometric and isokinetic devices inhibit the natural movement patterns of acceleration and deceleration. In all motor skills, muscular forces interact to move the body parts through the activity. The displacement of the body parts and their speed of motion are important in the coordination of the activity and are also directly related to the forces produced. 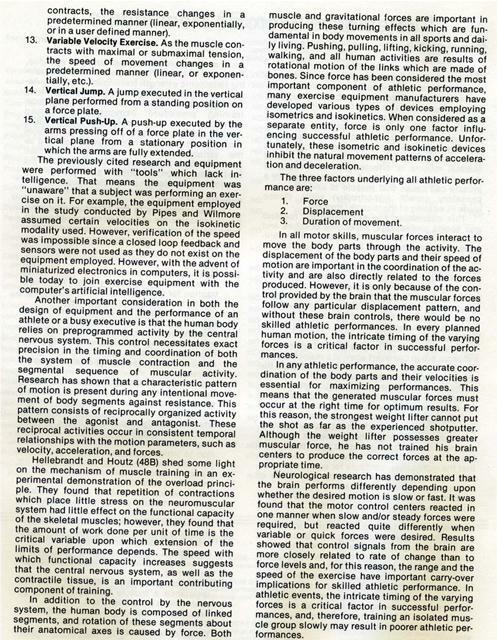 However, it is only because of the control provided by the brain that the muscular forces follow any particular displacement pattern, and without these brain controls, there would be no skilled athletic performances. In every planned human motion, the intricate timing of the varying forces is a critical factor in successful performances. In any athletic performance, the accurate coordination of the body parts and their velocities is essential for maximizing performances. This means that the generated muscular forces must occur at the right time for optimum results. For this reason, the strongest weight lifter cannot put the shot as far as the experienced shotputter. Although the weight lifter possesses greater muscular force, he has not trained his brain centers to produce the correct forces at the appropriate time. Neurological research has demonstrated that the brain performs differently depending upon whether the desired motion is slow or fast. It was found that the motor control centers reacted in one manner when slow and/or steady forces were required, but reacted quite differently when variable or quick forces were desired. Results showed that control signals from the brain are more closely related to rate of change than to force levels and, for this reason, the range and the speed of the exercise have important carry-over implications for skilled athletic performance. In athletic events, the intricate timing of the varying forces is a critical factor in successful performances, and, therefore, training an isolated muscle group slowly may result in poorer athletic performances. In characterizing the movements of an athlete, the description is not of the independent contraction of hundreds of thousands of muscle fibers, but instead the particular activity is specified: throwing, running, jumping, blocking, etc. All athletic movements result from contractions of muscles and the synergists in relative standard patterns of coordinated activity. Therefore, research in exercise machine design should view the problem of motor control in terms of the sequencing and coordination of agonists and antagonists. Ballistic motion results from properly timed contractions of muscles integrating all of the joints involved in the activity. Because most athletic events are ballistic movements and since the neural control of these patterns differs from slow controlled movements, it is essential that training routines employ programmable motions to suit specific movements. There is a significant difference between isotonic and isokinetic exercises. In Isotonic exercises the inertia, that is, the initial resistance, has to be overcome first and then the execution of the movement progresses. The weight of the resistance can not be heavier than the maximum strength of the weakest muscle acting in a particular movement, or else the movement cannot be completed. Consequently the amount of force generated by the muscles during an isotonic contraction does not maintain maximum tension throughout the entire range of motion. In an isokinetically loaded muscle, the desired speed of movement occurs almost immediately and the muscle is able to generate a maximal force under a controlled and specifically selected speed of contraction. The use of the isokinetic principle for overloading muscles to attain their maximal power output have direct applications in the fields of sports medicine and athletic training. Many rehabilitation programs utilize isokinetic training to recondition injured limbs to their full range of motion. Many athletes now train with "isokinetic equipment" to develop a muscle's maximum power output capacity at a speed of contraction similar to that required in their particular performance. The unfortunate drawback to this type of training is that the speed is constant and there are no athletic activities which are performed at a constant velocity. In 1945 Delorm (34) made one of the first attempts to study dynamic resistance training (isotonic) and in 1948 again with Watkins (34, 35), they introduced the concept of progressive resistance exercise (PRE). This concept involved three sets of lifting, each based on the amount of weight that can be lifted no more than ten times or ten repetitions maximum (10RM). Since the program is based on the progressive resistance principle, the 10RM must be adjusted periodically as strength gains occur. Although prior to the early sixties there was very little work done in this area, McQueen (64) in 1954 distinguished between exercise regimens for producing muscle hypertrophy and those for producing muscle power. He concluded that the number of repetitions for each set of exercise determines the different characteristics of the exercise. Based on that evidence, Berger flooded the research literature in an attempt to find the optimal combination of sets and repetitions for the gain of muscular strength (11-20). Berger used a one repetition maximum (1-RM) as his criterion for strength gain and had groups train at two, four, six, eight, ten, and twelve repetitions maximum for each set. His findings revealed that three sets of four to eight repetitions for three times per week was the optimum training schedule for producing strength gains. The study also showed that training with two repetitions was better than training with 10-12 repetitions, which suggests that the closer the subject works to his 1-RM, the greater the strength gains. Other research by Steinhause (86) emphasized the need to increase the intensity rather than the amount of work in order to develop maximum strength. In constant resistance training, if more than one repetition is to be used, one must use submaximal overload on the initial contractions in order to complete the required repetitions. Otherwise, the entire regimen will not be completed due to fatigue. Berger and Hardage (19) studied this problem by training two groups of men with 10-RM. One group trained following the standard Berger technique while the other group used one repetition maximum for each of the ten repetitions. This was accomplished by progressively reducing the weight for the next repetition in a manner which paralleled the fatigue of the muscle. The results showed that the intensity of the work seemed to be the important factor in strength increases, since the maximal overload group showed significantly greater strength gains than did the standard 1ORM group. Based on these findings it would seem appropriate to assume that a modality which can adjust the resistance so that it parallels fatigue to allow the maximum RM for each repetition would be superior to the currently available equipment. Berger accomplished this function by removing weight from the bar while the subject trained. This is neither the most convenient nor the most practical method. With the aid of the modern computer, this function can be performed automatically. the length tension curve, the muscle can only obtain maximal overload in a small portion of the range of motion (8, 88). To overcome this shortcoming of constant resistance training, several companies (Universal, Nautilus and others) have manufactured strength training devices which have "variable resistance" mechanisms in them. Variable resistance uses pulley and cam systems or combinations of levers to attempt to change the resistance lever arm. The objective is that when the skeletal system is at its greatest disadvantage, the equipment's load is the lightest, and when the skeletal system is at its greatest advantage, the machine's weight is the heaviest for the muscle. Actually the Universal and the Nautilus systems increase the resistance in a linear fashion but this linearity does not truly accommodate the individual. Also, individuals differ and, therefore, the variable constant of the existing machines only attempts to accommodate the resistance. If one includes consideration of inertial forces, then the accommodating resistance might be cancelled by the velocity of the movement. Thus, the term "variable resistance" is more appropriate than accommodating resistance. Very little research exists comparing variable resistance exercise with other conventional strength training programs. A few studies by Ariel (4-7) compared the Universal dynamic variable resistance (DVR) with conventional Olympic barbells and revealed the superiority of the DVR machine as far as both the rate of improvement of strength and absolute strength gains. A study by Pipes (76), also comparing DVR training with constant resistance (CR) training, demonstrated strength increases for both groups but emphasized that the relative increases were dependent onthe method in which relative strength was assessed (i.e. DVR versus CR procedures). Pipes suggested that improvement should be the greatest when tested with the device or procedure that approximated the training procedure. That means specificity of training. In other words, if a person trains fast and tests slow, he might not demonstrate the same level of progress as if he were to both train and test at the same speed. This phenomenon is extremely important since the effects of carry over training to performance are probably interdependent. For example, if a javelin thrower wants to improve his throwing capability by increasing his strength, he should train on a modality which allows the speed of motion to be comparable to his javelin throw. One of the methods employed by the Eastern European countries in their athletic training programs is to assign the proper mode of training for each specific event. more important question for future consideration is to determine the carry over effect of different types of training on independent testing of strength, power, and speed of movement. One of the newest developments in strength training and probably one which has been investigated most is isokinetics. Isokinetic simply means the same or constant motion. Isokinetic exercise is a form of isotonic exercise with one major difference. By accommodating the resistance against a lever moving at a fixed velocity, it allows continuous exercise with maximal dynamic overload throughout the entire range of motion. Therefore, isokinetics truly provides an "accommodating resistance" at a specific velocity (23, 28, 51, 73, 88). Isokinetics has received a great deal of clinical application (10, 23, 28, 46, 48, 70, 83) but applications in training studies are somewhat limited. In 1967, Thistle et al. (88) compared isotonic and isometric training and found that after eight weeks, the isokinetic group gained 35 percent in total work output, while the isotonic and the isometric groups gained 27.5 and 9.4 percent, respectively. In a similar study, Moffroid et al. (66) found that isokinetic and isometric methods of training produced greater strength gains than isotonic training after four weeks of exercise. 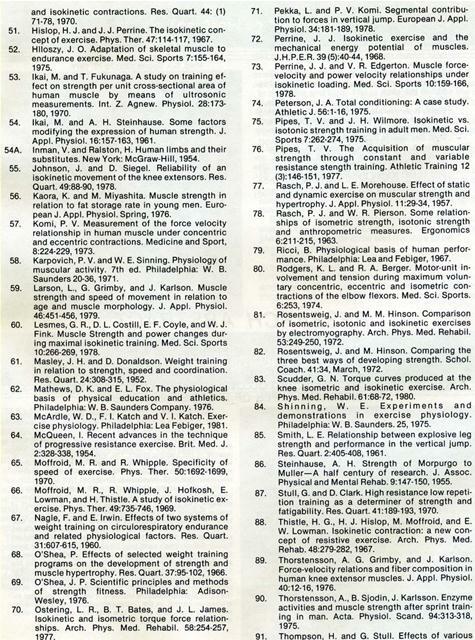 Pipes and Wilmore (75) conducted a study in 1975 comparing isokinetic and isotonic training. Thirty-six men were trained for eight weeks in one of four types of exercise: isotonic, slow isokinetic (24 deg/sec), fast isokinetic (136 deg/seg) and a control group. Strength was measured both isotonically and isokinetically in addition to five performance variables and body composition measurements before and after training. They concluded that fast speed isokinetic was superior to both isotonic and slow speed isotonic on strength and performance criteria. It should be noted that the accuracy of this study has been questioned by Berger and Wilmore. Thus, this study must be viewed with caution until further research can substantiate these findings. 1. Low power (low speed, high load) exercise produced greater increases in muscular force only at low speeds. 2. High power (high speed, low load) exercise produced increases in force at all speeds of contraction at and below the training speed. 3. High power exercise increased muscular endurance at high speeds more than low power exercise was able to increase muscular endurance at low speeds. Thus, the principle of specificity of training was reinforced by showing that the amount of work done is not as important as the rate at which it is performed (65). Moffroid's conclusions, however, do not agree with a recent study by Krokiewski et al., who trained a group of 10 women for five weeks isokinetically (60 deg/sec). Krokiewski's results showed strength gains at all velocities (0, 30, 60, 120, and 180 deg/sec). Rosentsweig et al. (81) compared isometric, isotonic, and isokinetic exercise by electromyography. They concluded that isotonic activity and isokinetic exercise produced more muscular electrical activity than was elicited by isometric exercise. However, there was no difference in the muscular electrical activity generated when isokinetic and isotonic exercises were compared. 35 percent near the end of the movement. (54A) in 1954 pointed out some of these variations. are produced against resistance no matter what the angular position of the articulating segment. This is surprising since the lever arms through which the muscles act vary continuously with changing position of the part. To produce such an effect necessitates a varying force to compensate for the varying lever arm, and such a mechanism is actually found in the muscle itself. In the body, therefore, is a reciprocating arrangement of muscles and levers by which changing lengths of lever arms are offset by changes in the ability of the muscles to develop torques about the joints. The nicety of the compensatory relationship and the physiology of muscle contraction has not been fully appreciated. This is a description of the compensatory interaction between the length-tension curve and the leverage system in normal movement without great resistance being applied to the body segment. However, when great resistance is applied to the body segment, the length-tension phenomenon changes dramatically by the additional load and the investigator must be aware of these changes and be able to quantify the changes. Without such considerations, his research is worthless. designing exercise equipment when the goal of that equipment is to facilitate efficient muscular strength development. Not only do force values vary among muscle groups but the rotational effect of a given group depends on the position of the joint it moves. In weight training for sports activities or for rehabilitation, the ultimate objective is for the muscle to function at maximum efficiency throughout the range of movement. These objectives necessitate proper assignment of force, displacement, and velocity, as well as when desired, time, acceleration, the amount of work, and power. To accomplish this objective, it is necessary to assess man's biomechanical changes and then develop a resistance and velocity intensity that will accommodate those changes in a functional manner. The variations in resistance intensity and velocity must be precisely incorporated into an intelligent resistance lifting mechanism. It is likewise essential that the entire machine design and operation do not adversely affect the performance of this mechanism. To prevent both machine design and operational failures, it is necessary to understand the relative effects of inertia. Inertial forces affect the motion and the magnitude of the muscle's involvement. The smaller the inertial force produced by the machine's moving parts, the greater the muscular involvement. In order to maintain small inertial forces, it is important to retain proper mechanical balances in the lifting ratios and allow the machine to use its own intelligence to control the moving parts. Obviously, this control must be supplied by the micro-computer which senses the movement of the machine's parts. This inertia controlled mechanism cannot be ignored in optimum equipment design. In all the previous descriptions of exercise equipment, the user has had to determine the amount of resistance and the number of repetitions desired. The reason the user made the choices was, of course, that the exercise equipment itself was inherently incapable of any intellectual participation. 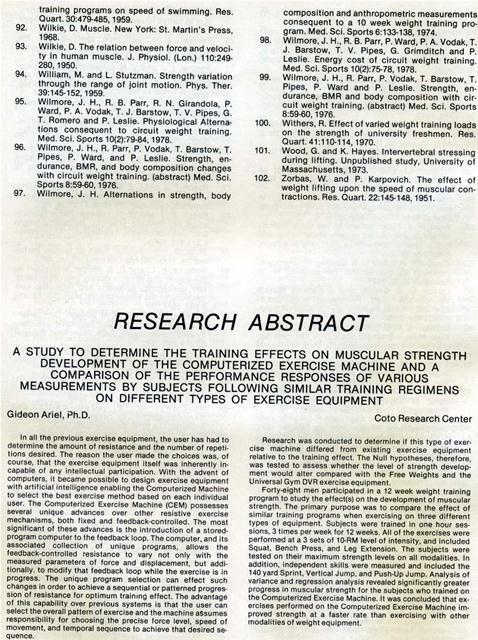 However, with the advent of computers, it became possible to design exercise equipment with artificial intelligence enabling the computerized machine to select the best exercise method based on each individual user. The original concept was published by Ariel (4) in 1976. Thus, the user need not be an expert in any biological, physiology, or exercise area since the exercise machine is programmed with information from many scientific fields thus, correctly benefitting the different individual users. novative features and mechanisms to the longestablished fields of resistive exercise or training for athletics, rehabilitation, and physical fitness. 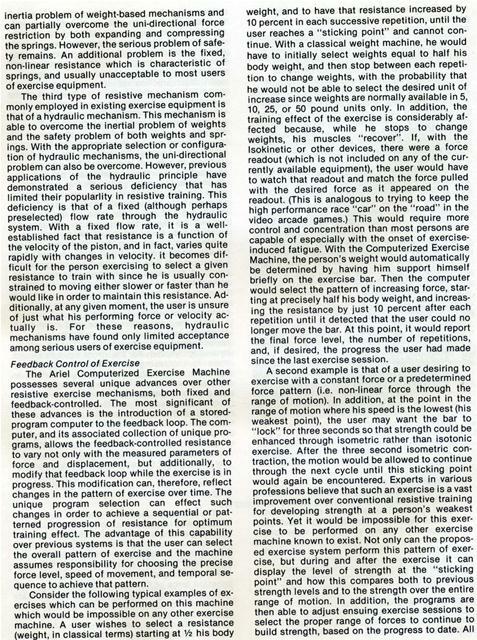 The underlying principle behind these innovations is that of a computer controlled feedback or servomechanism which is able to maintain any desired pattern of force and motion throughout the range of each exercise, regardless of the magnitude or rate of force applied by the person exercising. The advantages of an intelligent feedback-controlled mechanism over existing resistive exercise mechanisms are many. The biomechanical considerations are the most important for exercise equipment and have been previously explained. Inertia is the property of resisting any change in motion and, because of this property, it requires a greater force to begin moving weights than it does to keep them moving in a constant manner. Similarly, when the person exercising slows his motion at the end of an exercise movement, the weights tend to keep moving until slowed by gravity. This phenomenon reduces the required force at the end of a motion sequence. This property becomes especially pronounced as acceleration and deceleration increase, effectively reducing the useful range of motion of weight-based exercise equipment. The risk of injury is obvious in weight-based exercise equipment. When weights are raised during the performance of an exercise, they must be lowered to their original resting position before the person using the equipment can release the equipment and stop exercising. Injury could easily result if the weights fell back to their resting position accompanied by the concomitant motion of the bar or the handle attached to the weights. If the person exercising happened to lose his grip, or was unable to hold the weights due to exhaustion or inbalance, serious injuries could and have resulted. Finally, while being raised or lowered, weights or exercise equipment employing weights offer resistance only in the direction opposite to that of gravity. This resistance can be redirected by pulleys and gears, but still remains uni-directional. In almost every exercise performed, the muscle or muscles being trained by resistance in one direction are balanced by a corresponding muscle or muscles that could be trained by resistance in the opposite direction. With weight-based systems, a different exercise, and often a different mechanism, are necessary to train these opposing muscles. inertia problem of weight-based mechanisms and can partially overcome the uni-directional force restriction by both expanding and compressing the springs. However, the serious problem of safety remains. An additional problem is the fixed, non-linear resistance which is characteristic of springs, and usually unacceptable to most users of exercise equipment. The third type of resistive mechanism commonly employed in existing exercise equipment is that of a hydraulic mechanism. This mechanism is able to overcome the inertial problem of weights and the safety problem of both weights and springs. With the appropriate selection or configuration of hydraulic mechanisms, the uni-directional problem can also be overcome. However, previous applications of the hydraulic principle have demonstrated a serious deficiency that has limited their popularlity in resistive training. This deficiency is that of a fixed (although perhaps preselected) flow rate through the hydraulic system. With a fixed flow rate, it is a wellestablished fact that resistance is a function of the velocity of the piston, and in fact, varies quite rapidly with changes in velocity. it becomes difficult for the person exercising to select a given resistance to train with since he is usually constrained to moving either slower or faster than he would like in order to maintain this resistance. Additionally, at any given moment, the user is unsure of just what his performing force or velocity actually is. For these reasons, hydraulic mechanisms have found only limited acceptance among serious users of exercise equipment. The Ariel Computerized Exercise Machine possesses several unique advances over other resistive exercise mechanisms, both fixed and feedback-controlled. The most significant of these advances is the introduction of a storedprogram computer to the feedback loop. The computer, and its associated collection of unique programs, allows the feedback-controlled resistance to vary not only with the measured parameters of force and displacement, but additionally, to modify that feedback loop while the exercise is in progress. This modification can, therefore, reflect changes in the pattern of exercise over time. The unique program selection can effect such changes in order to achieve a sequential or patterned progression of resistance for optimum training effect. The advantage of this capability over previous systems is that the user can select the overall pattern of exercise and the machine assumes responsibility for choosing the precise force level, speed of movement, and temporal sequence to achieve that pattern. tion to change weights, with the probability that he would not be able to select the desired unit of increase since weights are normally available in 5, 10, 25, or 50 pound units only. In addition, the training effect of the exercise is considerably affected because, while he stops to change weights, his muscles "recover". If, with the Isokinetic or other devices, there were a force readout (which is not included on any of the currently available equipment), the user would have to watch that readout and match the force pulled with the desired force as it appeared on the readout. (This is analogous to trying to keep the high performance race "car" on the "road" in the video arcade games.) This would require more control and concentration than most persons are capable of especially with the onset of exerciseinduced fatigue. With the Computerized Exercise Machine, the person's weight would automatically be determined by having him support himself briefly on the exercise bar. 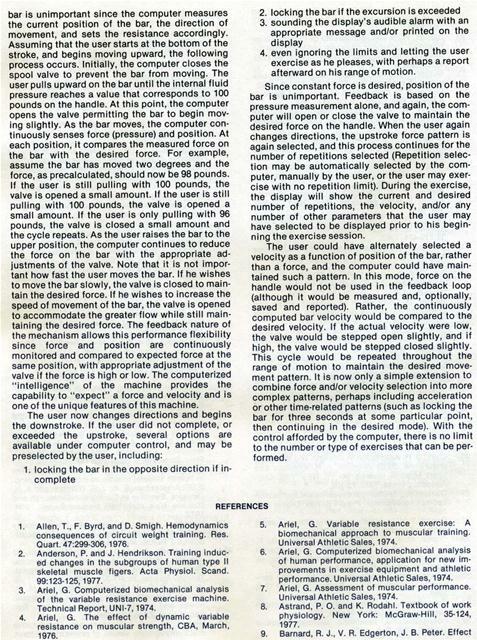 Then the computer would select the pattern of increasing force, starting at precisely half his body weight, and increasing the resistance by just 10 percent after each repetition until it detected that the user could no longer move the bar. At this point, it would report the final force level, the number of repetitions, and, if desired, the progress the user had made since the last exercise session. of this is accomplished without the user having to remember or reenter any data. 1. Two-way, single-rod-end hydraulic cylinder. 3. DC stepper motor (bi-directional) for turning hydraulic valve. 4. Hydraulic connector block, used to connect various hydraulic components in the proper configuration. 5. Hydraulic check valves to permit flow of fluid in one direction only. 6. Pressurized fluid reservoir, to accommodate fluid volume changes due to movement of single-rod-end cylinder. 7. Brackets for attaching cylinder assembly to frame and bar. 8. Supporting frame for exercise machines. 9. The bar is assembled in such a way that it pivoted at the frame and attached at a point along its length to the rod of the hydraulic cylinder. Movement of the free end of this bar causes the piston to move in the hydraulic cylinder. 10. Detachable handles, pads, plates, etc. as means to interface moveable bar to the user. 11. Pressure transducer for measuring force on the hydraulic piston through a measurement of the hydraulic fluid pressure. 12. Angular displacement transducer, consisting of a potentiometer coupled to the rotating pivot shaft of the bar. 13. A/D converter for translating voltage levels from the transducers (numbers 11 and 12 above) to digital values readable by the computer. 14. Stepper motor driver, for converter digital pulses from the computer to the proper power switching sequence for driving the stepper motor in the forward or reverse directions. 15. Stepper motor power supply. 16. Computer: Consisting of central processing unit, internal memory, multiple display interface, printer interface, AID converter interface, digital output interface, extended secondary memory (disks), appropriate power supplies, and cabinet or housing. 19. Light pen for display. ankles, shoulders, etc., between or under pads attached to the moveable bar. The exercise consists of alternately pulling and pushing on the bar (or any handle-like attachments) so that the bar pivots about its point of attachment in alternate directions. As the bar pivots, the attached cylinder rod moves the hydraulic piston up or down depending upon the direction of the exercise. As the hydraulic piston moves, fluid is forced out of one end of the cylinder, through the appropriate check values, through the rotary spool valve, and back into the opposite end of the cylinder. Fluid is shunted to and from the make-up reservoir on the low-pressure side of the spool valve to accommodate the change in volume in the cylinder as the rod moves in and out. This reservoir is pressurized to avoid cavitation on the low pressure side of the piston during rapid movement of the rod. Fluid pressure on the high pressure side of the spool valve is continuously monitored and, since the area of the piston is known, the force on the rod is continuously calculated by the computer. Similarly the angular displacement of the bar is continuously monitored by comparing the voltage output of the potentiometer with the reference voltage at the limits of excursion. In addition, velocity and acceleration of the bar are also computed on a continuous basis based on sequential readings of displacement measured against the precision real-time clock in the computer. With the spool valve full open the bar freely moves up and down with only a small amount of resistance due to the sliding friction of the hydraulic cylinder. As the spool valve is closed, there is increasing resistance to the flow of hydraulic fluid in the system, and, therefore, increasing resistance to moving the cylinder rod and the bar attached to it. At the full closed position of the valve, the cylinder cannot be moved, and the bar is locked in position. Due to the construction of the cylinder, and the appropriate arrangement of the check valves, this system yields a resistance in either direction of motion. Furthermore, the direction of motion may be reversed at any time without the mechanism having to change modes or configuration, other than perhaps an adjustment of the spool valve to yield the appropriate resistance for the given direction of motion. bar is unimportant since the computer measures the current position of the bar, the direction of movement, and sets the resistance accordingly. Assuming that the user starts at the bottom of the stroke, and begins moving upward, the following process occurs. Initially, the computer closes the spool valve to prevent the bar from moving. The user pulls upward on the bar until the internal fluid pressure reaches a value that corresponds to 100 pounds on the handle. At this point, the computer opens the valve permitting the bar to begin moving slightly. As the bar moves, the computer continuously senses force (pressure) and position. At each position, it compares the measured force on the bar with the desired force. For example, assume the bar has moved two degrees and the force, as precalculated, should now be 98 pounds. If the user is still pulling with 100 pounds, the valve is opened a small amount. If the user is still pulling with 100 pounds, the valve is opened a small amount. If the user is only pulling with 96 pounds, the valve is closed a small amount and the cycle repeats. As the user raises the bar to the upper position, the computer continues to reduce the force on the bar with the appropriate adjustments of the valve. Note that it is not important how fast the user moves the bar. If he wishes to move the bar slowly, the valve is closed to maintain the desired force. If he wishes to increase the speed of movement of the bar, the valve is opened to accommodate the greater flow while still maintaining the desired force. The feedback nature of the mechanism allows this performance flexibility since force and position are continuously monitored and compared to expected force at the same position, with appropriate adjustment of the valve if the force is high or low. The computerized "intelligence" of the machine provides the capability to "expect" a force and velocity and is one of the unique features of this machine. afterward on his range of motion. Since constant force is desired, position of the bar is unimportant. Feedback is based on the pressure measurement alone, and again, the computer will open or close the valve to maintain the desired force on the handle. When the user again changes directions, the upstroke force pattern is again selected, and this process continues for the number of repetitions selected (Repetition selection may be automatically selected by the computer, manually by the user, or the user may exercise with no repetition limit). During the exercise, the display will show the current and desired number of repetitions, the velocity, and/or any number of other parameters that the user may have selected to be displayed prior to his beginning the exercise session. The user could have alternately selected a velocity as a function of position of the bar, rather than a force, and the computer could have maintained such a pattern. In this mode, force on the handle would not be used in the feedback loop (although it would be measured and, optionally, saved and reported). Rather, the continuously computed bar velocity would be compared to the desired velocity. If the actual velocity were low, the valve would be stepped open slightly, and if high, the valve would be stepped closed slightly. This cycle would be repeated throughout the range of motion to maintain the desired movement pattern. It is now only a simple extension to combine force and/or velocity selection into more complex patterns, perhaps including acceleration or other time-related patterns (such as locking the bar for three seconds at some particular point, then continuing in the desired mode). With the control afforded by the computer, there is no limit to the number or type of exercises that can be performed. 1. Allen, T., F. Byrd, and D. Smigh. Hemodynamics consequences of circuit weight training. Res. Quart. 47:299-306,1976. 2. Anderson, P. and J. Hendrikson. Training induced changes in the subgroups of human type It skeletal muscle figers. Acta Physiol. Scand. 99:123-125,1977. 3. Ariel, G. Computerized biomechanical analysis of the variable resistance exercise machine. 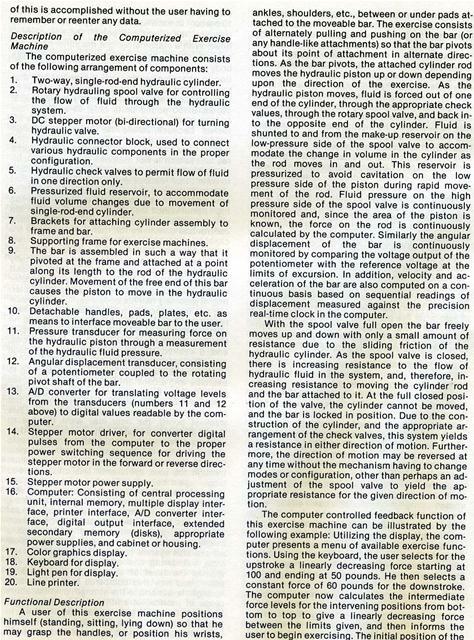 Technical Report, UNI-7, 1974. 4. 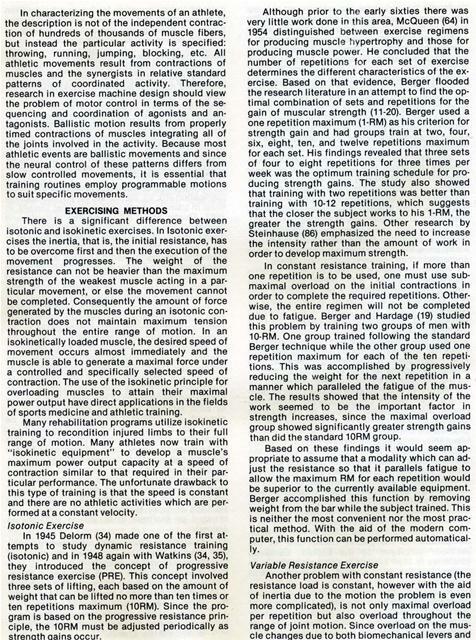 Ariel, G. The effect of dynamic variable resistance on muscular strength, CBA, March, 1976. 5. Ariel, G. Variable resistance exercise: A biomechanical approach to muscular training. Universal Athletic Sales, 1974. 6. Ariel, G. Computerized biomechanical analysis of human performance, application for new improvements in exercise equipment and athletic performance. Universal Athletic Sales, 1974. 7. Ariel, G. Assessment of muscular performance. Universal Athletic Sales, 1974. 8. Astrand, P. 0. and K. Rodahl. Textbook of work physiology. 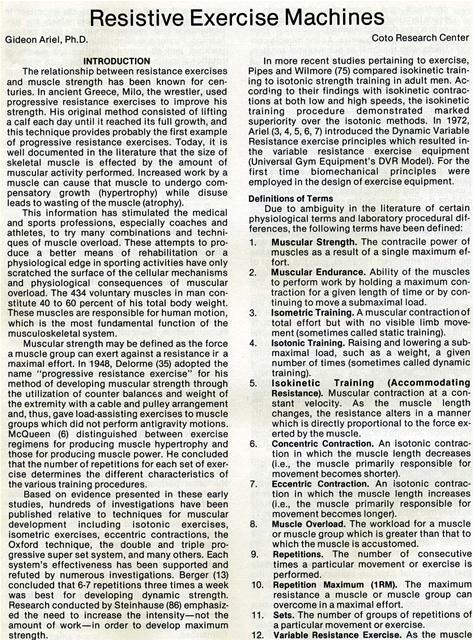 New York: McGraw-Hill, 35-124, 1977.
of exercise on skeletal muscle. Biochemical and Histological Properties. J. Appl. Physiol. 28:762766,1970. 10. Barnes, W. S. The relationship of motor-unit activation to isokinetic muscular contraction at different contractile velocities. Phy. Ther. 60:11521158,1980. 11. Berger, R. A. Effect of varied weight training programs on strength. Res. Quart. 33:168-181, 1962. 12. Berger, R. A. Comparison of static and dynamic strength. Res. Quart. 33:329-333,1962. 13. Berger, R. A. Optimum repetitions for the development of strength. Res. Quart. 33:334-338, 1962. 14. Berger, R. A. Comparison between resistance load and strength improvement. Res. Quart. 33:637,1962. 15. Berger, R. A. Comparison between static training and various dynamic training programs. Res. Quart. 34:131-135,1963. 16. Berger, R. A. Comparative effects of three weight training programs. Res. Quart. 34:396398,1963. 17. Berger, R. A. Effects of dynamic and static training on vertical jumping ability. Res. Quart. 34:419-424,1963. 18. Berger, R. A. Comparison of the effect of various weight training loads on strength. Res. Quart. 36:141-146,1964. 19. Berger, R. A. and B. Hardage. Effect of maximal load for each of ten repetitions on strength improvement. Res. Quart. 38:718-718,1966. 20. Berger, D. Comparison of dynamic, static and combination training on dominant wrist flexor muscles. Res. Quart. 39:244-250,1968. 21. Capen, E. K. The effect of systematic weight training on power, strength, and endurance. Res. Quart. 21:83-93,1950. 22. Chaffin, D. B., M. Lee and A. Freivalds. Muscle strength assessment from EMG analysis. Med. Sci. Sports 12:(3) 205-211, 1980. 23. Chu, D. A. and G. Smith. Isokinetic exercise: controlled speed and accommodating resistance. Athletic Training 6:18-22, 1971. 24. Chui, E. The effect of systematic weight training on Athletic power. Res. Quart. 21:188-194, 1950. 25. Clark, D. and F. Henry. Neuromuscular specificity and increased speed from strength development. Res. Quart. 32:315-325,1961. 26. Clark, D. H. Adaptation in strength and muscular endurance. (EDS) Wilmore, J. H. Exercise and sport science reviews vol. 1: New York City. Academic Press, 1973, 73-102. 27. 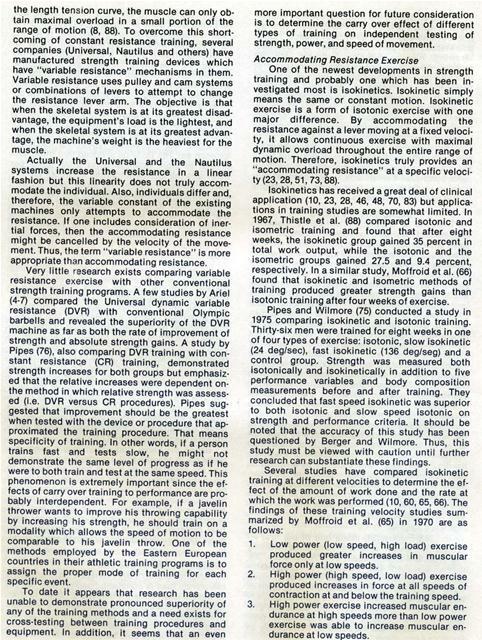 Clark, H. (EDS) Strength development and motorsports improvement. Phys. Fit. Res. Digest 4(4), 1975. 28. Coplin, T. H. Isokinetic exercise: Clinical usage. Athletic Training 6:160-164,1971. 29. Costill, D. L., E. F. Coyle, W. F. Fink, G. R. Lesmes, and F. A Witzmann. Adaptation in skeletal muscle following strength training. J. Appl. Physiol. 46:96-99,1979. 30. Counsilman, J. Isokinetic exercise, a new concept in strength building. Swimming World 10:4, 1969. 31. Counsilman, J. New approach to strength building. Schol. Coach. March, 1971. 32. Counsilman, J. Isokinetic exercise. Athletic Journal. 52(6), Feb., 1972. 33. Currier, D. P. Positioning for knee strengthening exercises. Phys. Ther. 57:148-152,1977. 34. Delorm, T. L. Restoration of muscle power by heavy resistance exercises. J. Bone Joint Surg. 27:645-667,1945. 35. Delorm, T. L. and A. L. Watkins. Techniques of progressive resistance exercise. Arch. Phys. Med. 29:263,1948. 36. Delorm, T. L., B. G. Ferris and J. R. Gallgher. Effect of progressive resistance exercise on muscle contraction time. Arch. Phys. Med. 33:86-92, 1952. 37. Edgerton, V. R. Neuromuscular adaptation to power and endurance work. Can. J. Appl. Sport Sci. 1:49-58,1976. 38. Etheridge, G. L. Physiological and biochemical changes of human skeletal muscle induced by different strength training programs. Unpublished dissertation, University of Kansas. 1981. 39. Fahey, T. D. and C. H. Brown. The effects of anabolic steroid on the strength, body composition, and endurance of college males when accompanied by a weight training program. Med. Sci. Sports, 5:272-276,1973. 40. Garfield, D. S., P. Ward, and R. Cobb. The Syracuse circuit weight training study report. Houston, Dynamic Health Equipment, 1979. 41. Gettman, L. R., P. Ward and R. D. Hagan. Strength and endurance changes through circuit weight training. National Strength & Cond. Assoc. J. Aug.-Sep., 1981. 42. Gettman, L. R. and J. J. Ayres, M. L. Pollock, and A. Jackson. The effect of circuit weight training on strength, cardiorespiratory function, and body composition of adult men. Med. Sci. Sports 10:171-176,1978. 43. Gettman, L. R. and J. J. Ayres. Aerobic Changes through 10 weeks of slow and fast speed isokinetic training (abstract). Med. Sci. Sports 10:47,1978. 44. Gettman, L. R. and L. A. Culter, and T. Strathman. Physiologic changes after 20 weeks of isotonic vs. isokinetic circuit training. J. Sports Med. Phys. Fit. 1980. 45. Gettman, L. R. and M. L. Pollock. Circuit weight training: A critical review of its physiological benefits. Phys. Sports Med. 9(1):44-60, 1981. 46. Gleim, B. A., J. A. Nicholas, and J. N. Webb. Isokinetic evaluation following leg injuries. Phys. Sports Med. 6(8):75-82,1978. 47. Gollnic, P. D. and W. L. Sembrowich. Adaptation in human skeletal muscle as a result of training. (EDS) Amsterdam, E. A., J. H. Wilmore, and A. N. Delmara. Exercise in Cardiovascular Health and Disease. New York: York Medical Books. 70-94, 1977. 48. Hansen, T. I. and J. H. Kristensen. Force-velocity relationships in the human quadriceps muscles. Scand. J. Rehab. Med. 11:85-89,1979. 48A. Hellebrandt, F. and Houtz, S. Mechanism of muscle training in man: experimental demonstration of overload principle. Physiol. Therapy Review. 36:371-376,1956. 49. Hickson, R. C., M. A. Rosenkoetter, and M. M. Brown. Strength training effects on aerobic power and short-term endurance. Med. Sci. Sports Exer. 2:336-339,1980.
and isokinetic contractions. Res. Quart. 44: (1)	71.
cept of exercise. Phys. Ther. 47:114-117, 1967. 72.
endurance exercise. Med. Sci. Sports 7:155-164,	73.
fect on strength per unit cross-sectional area of	74. 54. Ikai, M. and A. H. Steinhause. Some factors	75.
modifying the expression of human strength. J. 54A. Inman, V. and Ralston, H. Human limbs and their	76. 55.	substitutes. 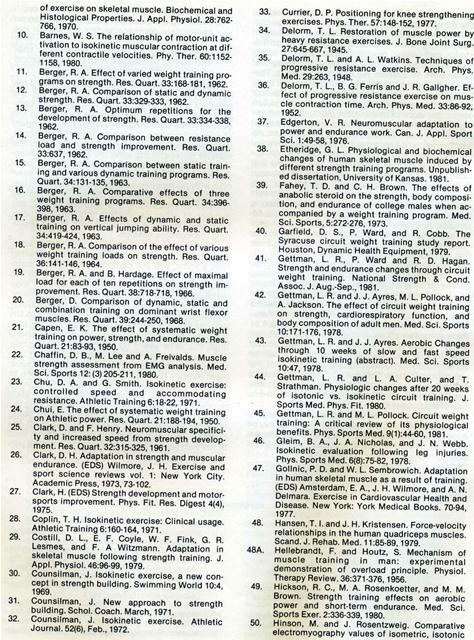 New York: McGraw-Hill, 1954.
isokinetic movement of the knee extensors. Res. 77.
relation to fat storage rate in young men. Euro	78.
pean J. Appl. Physiol. Spring, 1976.
relationship in human muscle under concentric	79.
muscular activity. 7th ed. Philadelphia: W. B. 80.
strength and speed of movement in relation to	81.
age and muscle morphology. J. Appl. Physiol. 60. Lesmes, G. R., D. L. Costill, E. F. Coyle, and W. J.
Fink. Muscle Strength and power changes dur	82.
in relation to strength, speed and coordination. 83.
basis of physical education and athletics. 84. Philadelphia: W. B. Saunders Company. 1976. 64.	cise physiology. Philadelphia: Lea Febiger, 1981. 85.
of progressive resistance exercise. Brit. Med. J. 65. Moffroid, M. R. and R. Whipple. Specificity of	86. 66. Moffroid, M. R., R. Whipple, J. Hofkosh, E.	87.
weight training on circulorespiratory endurance	88.
and related physiological factors. Res. Quart. programs on the development of strength and	89. 69.	muscle hypertrophy. Res. Quart. 37:95-102,1966.
of strength fitness. Philadelphia: Adison	90. 70. Ostering, L. R., B. T. Bates, and J. L. James. Isokinetic and isometric torque force relation	91. Pekka, L. and P. V. Komi. Segmental contribution to forces in vertical jump. European J. Appl. Physiol. 34:181-189,1978. Perrine, J. J. Isokinetic exercise and the mechanical energy potential of muscles. J. H. P. E. R. 39 (5):40-44, 1968. Perrine, J. J. and V. R. Edgerton. Muscle forcevelocity and power velocity relationships under isokinetic loading. Med. Sci. Sports 10:159-166, 1978. Peterson, J. A. Total conditioning: A case study. Athletic J. 56:1-16,1975. Pipes, T. V. and J. H. Wilmore. Isokinetic vs. isotonic strength training in adult men. Med. Sci. Sports 7:262-274, 1975. Pipes, T. V. The Acquisition of muscular strength through constant and variable resistance stength training. Athletic Training 12 (3):146-151,1977. Rasch, P. J. and L. E. Morehouse. Effect of static and dynamic exercise on muscular strength and hypertrophy. J. Appl. Physiol. 11:29-34, 1957. Rasch, P. J. and W. R. Pierson. 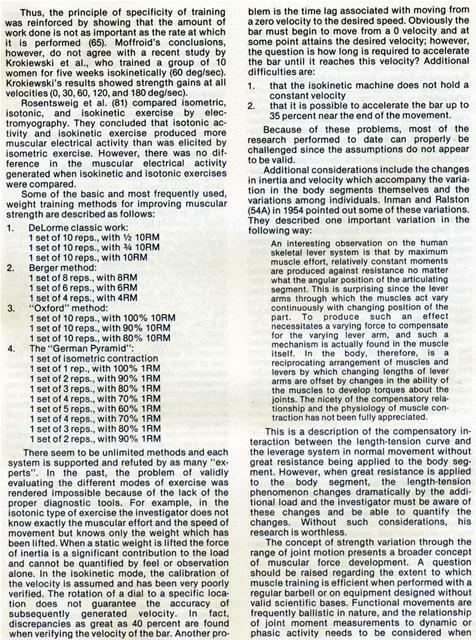 Some relationships of isometric strength, isotonic strength and anthropometric measures. Ergonomics 6:211-215.1963. Ricci, B. Physiological basis of human performance. Philadelphia: Lea and Febiger, 1967. Rodgers, K. L. and R. A. Berger. Motor-unit involvement and tension during maximum voluntary concentric, eccentric and isometric contractions of the elbow flexors. Med. Sci. Sports. 6:253,1974. Rosentsweig, J. and M. M. Hinson. Comparison of isometric, isotonic and isokinetic exercises by electromyography. Arch. Phys. Med. Rehabil. 53:249-250,1972. Rosentsweig, J. and M. Hinson. Comparing the three best ways of developing strength. Schol. Coach. 41:34, March, 1972. Scudder, G. N. Torque curves produced at the knee isometric and isokinetic exercise. Arch. Phys. Med. Rehabil. 61:68-72,1980. Shinning, W. E. Experiments and demonstrations in exercise physiology. Philadelphia: W. B. Saunders. 25, 1975. Smith, L. E. Relationship between explosive leg strength and performance in the vertical jump. Res. Quart. 2:405-408,1961. Steinhause, A. H. Strength of Morpurgo to Muller-A half century of research. J. Assoc. Physical and Mental Rehab. 9:147-150,1955. Stull, G. and D. Clark. High resistance low repetition training as a determiner of strength and fatigability. Res. Quart. 41:189-193,1970. Thistle, H. G., H. J. Hislop, M. Moffroid, and E. W. Lowman. Isokinetic contraction: a new concept of resistive exercise. Arch. Phys. Med. Rehab. 48:279-282,1967. Thorstensson, A. G. Grimby, and J. Karlson. Force-velocity relations and fiber composition in human knee extensor muscles. J. Appl. Physiol. 40:12-16,1976. Thorstensson, A., B. Sjodin, J. Karlsson. Enzyme activities and muscle strength after sprint training in man. Acta. Physiol. Scand. 94:313-318, 1975.
training programs on speed of swimming. Res. 94. William, M. and L. Stutzman. Strength variation	99.
through the range of joint motion. Phys. Ther. 95. Wilmore, J. H., R. B. Parr, R. N. Girandola, P.
Ward, P. A. Vodak, T. J. Barstow, T. V. Pipes, G.	100. 96.	tions consequent to circuit weight training. 101. Wilmore, J. H., R. Parr, P. Vodak, T. Barstow, T.
Pipes, P. Ward, and P. Leslie. Strength, en	102.
with circuit weight training. (abstract) Med. Sci. composition and anthropometric measurements consequent to a 10 week weight training program. Med. Sci. Sports 6:133-138,1974. Wilmore, J. H., R. B. Parr, P. Ward, P. A. Vodak, T. J. Barstow, T. V. Pipes, G. Grimditch and P. Leslie. Energy cost of circuit weight training. Med. Sci. Sports 10(2):75-78,1978. Wilmore, J. H., R. Parr, P. Vodak, T. Barstow, T. Pipes, P. Ward and P. Leslie. Strength, endurance, BMR and body composition with circuit weight training. (abstract) Med. Sci. Sports 8:59-60,1976. Withers, R. Effect of varied weight training loads on the strength of university freshmen. Res. Quart. 41:110-114,1970. Wood, G. and K. Hayes. Intervertebral stressing during lifting. Unpublished study, University of Massachusetts, 1973. Zorbas, W. and P. Karpovich. The effect of weight lifting upon the speed of muscular contractions. Res. Quart. 22:145-148, 1951. In all the previous exercise equipment, the user has had to determine the amount of resistance and the number of repetitions desired. The reason the user made the choices was, of course, that the exercise equipment itself was inherently incapable of any intellectual participation. 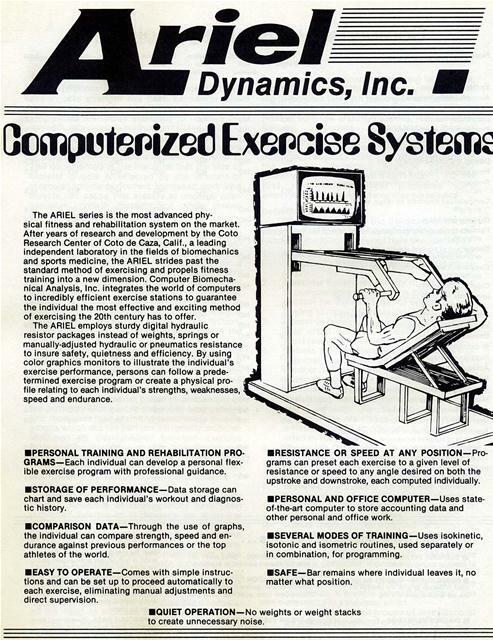 With the advent of computers, it became possible to design exercise equipment with artificial intelligence enabling the Computerized Machine to select the best exercise method based on each individual user. The Computerized Exercise Machine (CEM) possesses several unique advances over other resistive exercise mechanisms, both fixed and feedback-controlled. The most significant of these advances is the introduction of a storedprogram computer to the feedback loop. The computer, and its associated collection of unique programs, allows the feedback-controlled resistance to vary not only with the measured parameters of force and displacement, but additionally. to modify that feedback loop while the exercise is in progress. The unique program selection can effect such changes in order to achieve a sequential or patterned progression of resistance for optimum training effect. The advantage of this capability over previous systems is that the user can select the overall pattern of exercise and the machine assumes responsibility for choosing the precise force level, speed of movement, and temporal sequence to achieve that desired sequence. Research was conducted to determine if this type of exercise machine differed from existing exercise equipment relative to the training effect. The Null hypotheses, therefore, was tested to assess whether the level of strength development would alter compared with the Free Weights and the Universal Gym DVR exercise equipment. Forty-eight men participated in a 12 week weight training program to study the effect(s) on the development of muscular strength. The primary purpose was to compare the effect of similar training programs when exercising on three different types of equipment. Subjects were trained in one hour sessions, 3 times per week for 12 weeks. All of the exercises were performed at a 3 sets of 10-RM level of intensity, and included Squat, Bench Press, and Leg Extension. The subjects were tested on their maximum strength levels on all modalities. In addition, Independent skills were measured and included the 140 yard Sprint, Vertical Jump, and Push-Up Jump. Analysis of variance and regression analysis revealed significantly greater progress in muscular strength for the subjects who trained on the Computerized Exercise Machine. It was concluded that exercises performed on the Computerized Exercise Machine Improved strength at a faster rate than exercising with other modalities of weight equipment. The ARIEL Arm-Leg station concentrates on exercises specifically geared for the muscle groups in the arms and legs. These muscles include the biceps, triceps, quadriceps and hamstrings. As a complement to the ARIEL Multi-Function station, the Arm-Leg station gives the individual a large selection of exercises for personal fitness, rehabilitation, sports training and research. Accommodating resistance is possible through a computer-controlled bio-feedback loop. An individual can tailor a personal program to suit each person's variable velocity and force. To make the exercise more meaningful, the individual can minotir each performance and directly compare that workout to previous ones. Equipped with an ergonomically-designed seating station, the ARI EL Arm-Leg station has a common pivot that allows the arms and the legs to be exercised on the same unit. to be exercised either independently or together. With this feature, the Arm-Leg station is able to build and tone up the muscles in the shoulders, abdomen, triceps, forearms, thighs, knees and calves regions. The ARIEL Multi-Function Station provides the individual with personal fitness, sports training, rehabilitation and research in mind with exercises for the major muscle groups found in the entire body. 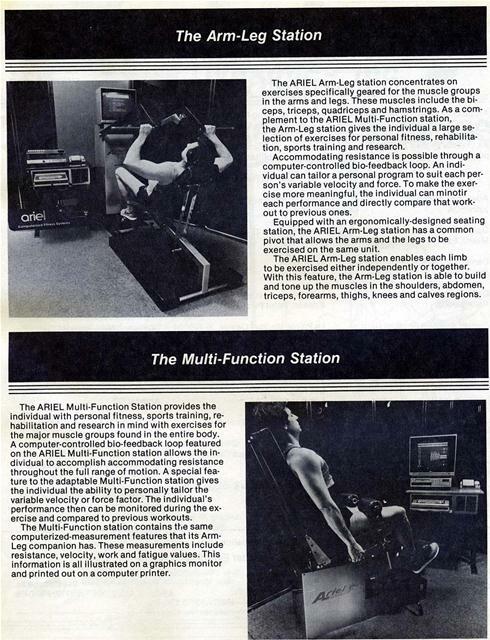 A computer-controlled bio-feedback loop featured on the ARIEL Multi-Function station allows the individual to accomplish accommodating resistance throughout the full range of motion. A special feature to the adaptable Multi-Function station gives the individual the ability to personally tailor the variable velocity or force factor. The individual's performance then can be monitored during the exercise and compared to previous workouts. The Multi-Function station contains the same computerized-measurement features that its ArmLeg companion has. These measurements include resistance, velocity, work and fatigue values. This information is all illustrated on a graphics monitor and printed out on a computer printer. 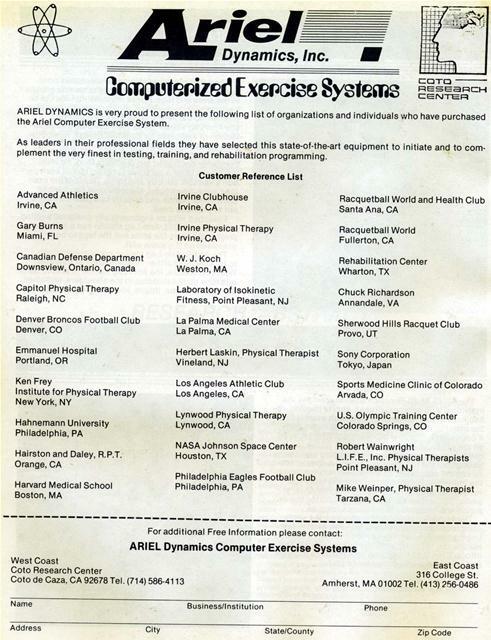 ARIEL DYNAMICS is very proud to present the following list of organizations and individuals who have purchased the Ariel Computer Exercise System. As leaders in their professional fields they have selected this state-of-the-art equipment to initiate and to complement the very finest in testing, training, and rehabilitation programming. Generated on 4/20/2019 3:56:49 PM (PST) ADI/HQ/GBA/2019/ARIELCLOUD/v3.0.2018.0126.